TFT/LCD 20" Rack industrial monitor with 19"/9HE front plate. TFT/LCD 19" Rack industrial monitor with 19"/9HE front plate. TFT/LCD 19" Rack industrial monitor with 19"/8HE front plate. TFT/LCD 17" Rack industrial monitor with 19"/8 HE front plate. TFT/LCD 15" Rack industrial monitor with 19"/7 HE front plate. 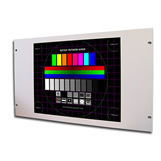 TFT/LCD 15" Rack industrial monitor with 19"/6 HE front plate. TFT/LCD 12,1" Rack industrial monitor with 19"/6 HE front plate.